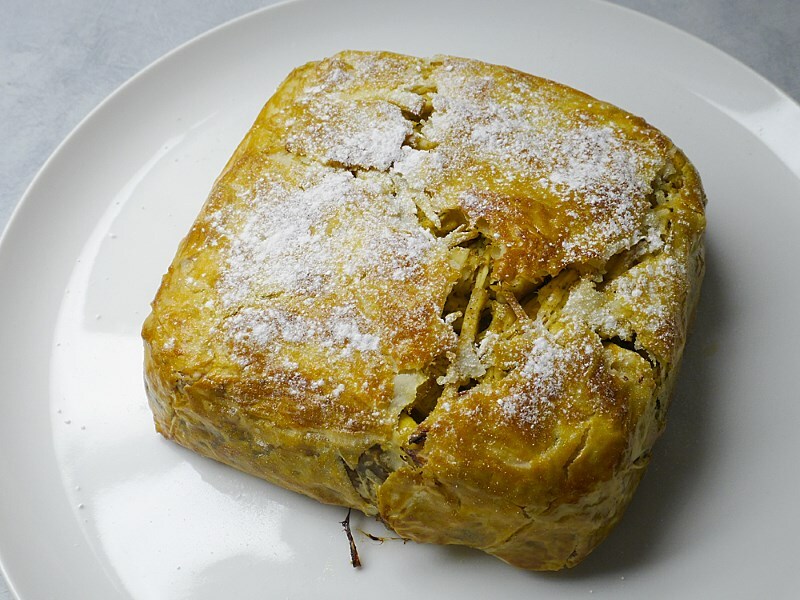 A friend in Europe recently shared his experience making Bastilla, which is a traditional Moroccan meat pastry dish that is both sweet and savory. Here is how his preparation went; after that, I'll post a listing of ingredients and other important notes, should anyone want to try this exquisite-looking meal! I have wanted to make a Bastilla for many years now, but I never did. 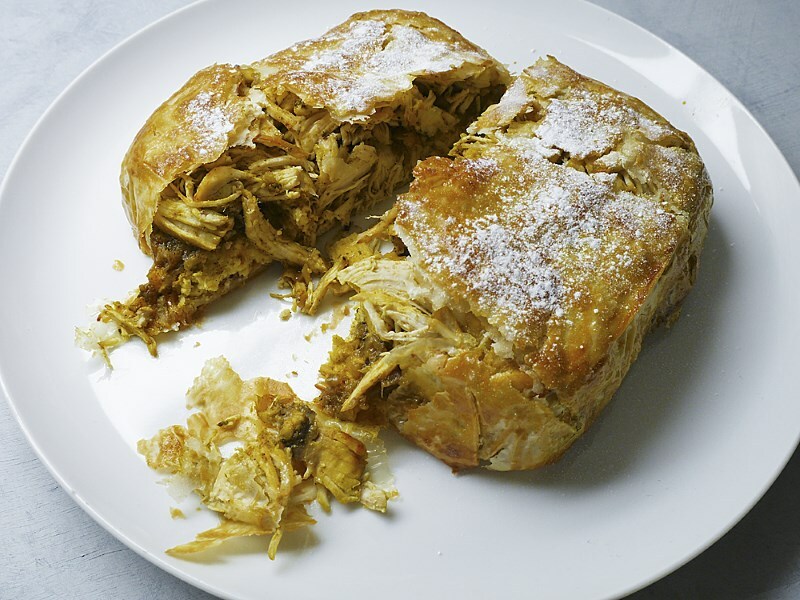 Normally, it would involve pigeon meat for a more authentic approach; however, after reading more in my Casablanca cook book, which is much more into contemporary Moroccan cooking, but with respect of tradition, I decided to make the author’s Moroccan chicken Bastilla (sometimes also written Pastilla, think pastry). It is not exactly a simple dish but in fact more time consuming than difficult. A Bastilla is a kind of meat pie, wrapped and baked in thin filo pastry. It’s preferably assembled in layers; for example, the one I made from this cook book Casablanca, it is made up of four layers (consisting of braised chicken, caramelized onions, scrambled eggs and almonds) and then finished with some lemon zest. The preparation starts with sweating a large amount of onions in olive oil, under cover, over a low fire for 20 minutes. 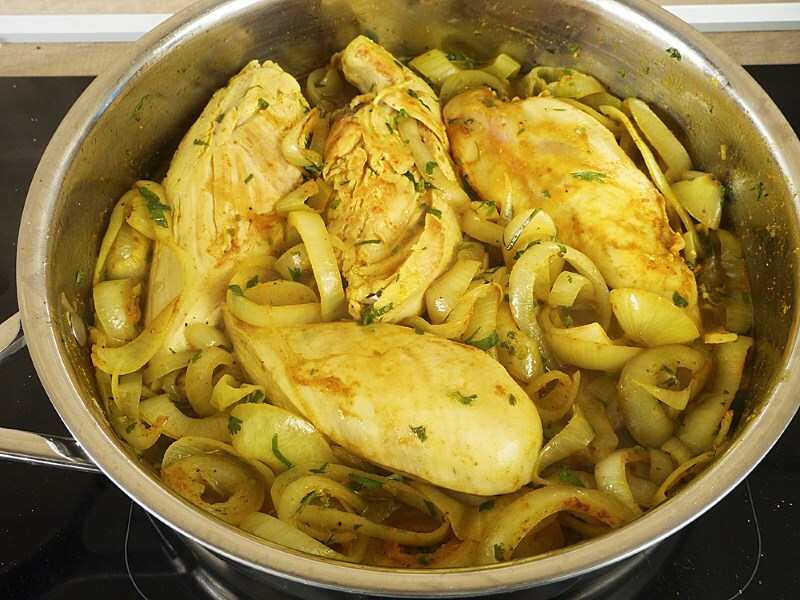 Then chicken is added; the book uses chicken breasts. Also added are cilantro, garlic, Ras el Hanout, turmeric, ginger powder, salt and pepper. Let fry for 5 minutes without a lid, then add a small cup of chicken stock. Bring to a boil, reduce the fire and braise under cover for 50 minutes. The caramelized onions are made with the ones used above. Remove the chicken first and leave it to cool at room temperature. Add 2 tablespoons of honey to the now remaining onions and a teaspoon of cinnamon. Let them cook for another 50 minutes, stirring now and then. The liquid has to be evaporated completely. For the almonds, use white (peeled) almonds. 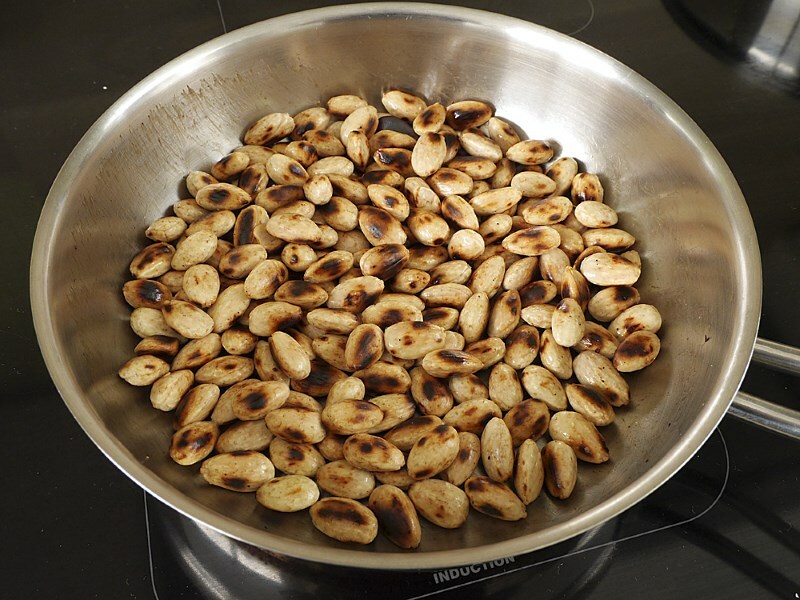 I roasted them in a pan at very low temperature for some 15 minutes, while tossing them often. Leave them to cool, then mix coarsely with a few tablespoons of sugar and another teaspoon of cinnamon. Set them aside. For the layer of scrambled eggs; melt a tablespoon of butter on medium low. Add the eggs and stir using a whisk until done. All of the liquid has to be gone, or it will affect the filo pastry. When everything is cooled, shred the chicken meat. 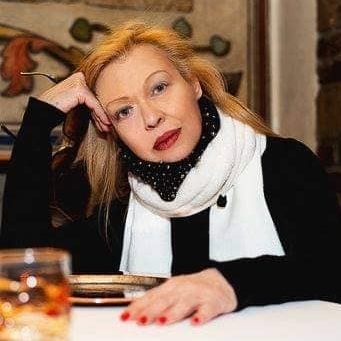 Now, take the filo pastry and cut it in appropriate sizes to fit the used recipient. Brush the filo sheets with melted butter and stack 3 sheets of filo on each other. Push gently into a ramequin or whatever recipient you desire. Start filling with chicken, then onions, then egg, then almond, and finally add lemon zest. Fold the dough to close, then turn the pastry upside down on an oven dish. Remove the recipient and bake. When done, sprinkle with sugar and cinnamon. This is an absolutely fantastic dish! I followed the recipe but used a little more than the 1/4 teaspoon spices mentioned in the onion and chicken preparation. My filo pastry was an ultra thin Turkish fabrication. I used 3 sheets instead of the book's recommendation of only 2 sheets. In my case, even 4 sheets would have been better because the filo came out cracked; all depends on the thickness of the filo. Nargisse Benkabbou uses 4 inch diameter ramequins for individual portions. I made one large one which is not unusual. When using 4 inch ramequin, she cuts the filo in 22 x 22 centimeter sheets (about 9 x 9 inch). To me, this really looks like a very special dish - I would love to try this sometime, and I hope that others will also be inspired to give it a go! Wow! does that look good! I have had this dish with Pheasant or Guinea Fowl in Paris at a Moroccan Restaurant. Very nice. I am sure it would be wonderful with any wild game birds and it is a popular autumn dish ..